After spending most of my free time during the winter months making and erecting Barn Owl boxes and barrels I had a very welcome and overdue "owling" session last night. Although very windy (not usually conductive for finding owls) it was however very bright during the last 2 hours before sunset. Because time was limited I edged my bets and visited a location where I had previously seen Barn Owls in similar conditions. Once there I slowly drove around the rough grassy area hoping to chance a hunting Barn Owl, this wasn't to be the case but instead I spotted a Little Owl flying across the field and up into a tree, I was compulsed to investigate further. I slowly drove around to where I thought it had landed only to find a very nice looking cavity about 10 feet up, but no owl! I positioned the car in an advantageous position and waited........ After a wait of around 10 minutes the owl appeared at the cavity, this offered a great photo opportunity. It sat at the cavity for a while scanning around making sure the coast was clear before it re-emerged. Luckily right next to the tree is a sheep pen which offered a variety of different perches for it to use. After a while the owl flew and landed on top of the Hawthorne hedge, seconds later it was joined by a second owl, not sure where this bird had been hiding? As the sun set both owls seemed to gain more confidence and moved around from perch to perch, one of them even dropped down into the tussocky grass right in front of the car! Eventually I was beaten by the light and reluctantly departed, whilst driving back up the field another larger bird (presumably an owl?) was seen flying across my path and up into a tree. 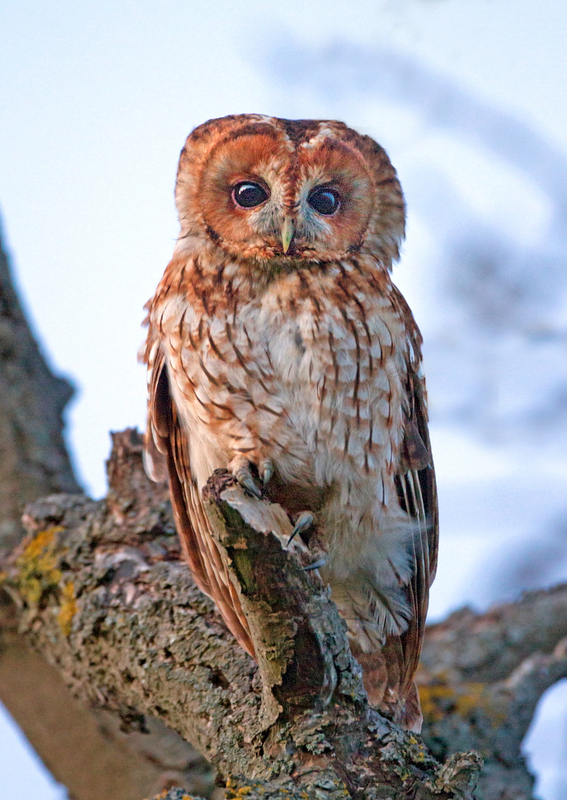 As I slowly approached I could see it was a Tawny Owl!!! It sat perched high up in the tree and didn't batter an eyelid at my presence! I slowly got got out of the car and pointed the camera up at it. It was almost dark, 8:44pm, at an ISO of 2000 I could only muster a shutter speed of 1/30 of a second whilst hand holding the camera (sorry for boring those who don't know photography settings). I wasn't very hopeful of attaining a photo that was going to be usable but among the rubbish I did have this one "usable" image. Last week I found myself working out in the Grantham area, I knew that there had been a wintering Bluethroat not too far away from where I was working and fortunately en-route between two of my planned calls. As it proved it was too much of a temptation and I made the effort to go and visit Willow Tree Fen LWT in Lincolnshire. So during my lunch hour I wandered down the track towards the 40 or so other birders that had already huddled together in a horseshoe shape around a small reed fringe ditch. Apparently it had been showing very well on and off all morning, but not when I arrived! Now I'm not really one for "twitches" as some of the behavior I have witnessed in the past by so called birders/photographers has appalled me, but not this time. Everyone there seemed to be conducting themselves in quite an orderly manner, just a low hum of people chatting, no shoving and pushing for more advantageous positions and patience was the order of the day. After no more than five minutes out popped this first winter male, I was very lucky too as at times it came very close indeed, what a bird! I know it must seem that I have been in hibernation recently because of the lack of posts, well I'll be back again soon to give an update on how my Barn Owl breeding programme went last year, a real success story. On Sunday morning I managed a few hours out with camera in hand, it was quite a pleasant morning and for the first time in what seems to be ages I had no other distractions like checking and maintaining my owl boxes. This was to be just a few hours out with nature and hopefully some subjects would show and allow for a few images. My main objective was to find some Little Owls, sadly after visiting several known sites not a single bird was either seen or heard. Whilst out it became quite noticeable just how many winter Thrushes (mainly Redwings and a few Fieldfares) were about, for the best part they would settle on one of the berry laden bushes and gorge themselves stupid, however, getting close enough to them to obtain an image proved to be quite a challenge. Trying to drive up slowly was a complete waste of time, as soon as I was with 30 metres or so they would erupt en-mass and move down to the next laden bush. After 30 minutes I gave up on this tactic and instead opted to park up near what seemed to be a favoured bush and waited for them to come to me. This new tactic proved to be slightly more successful than the last and the odd Redwing did come close enough for a few images (nothing good enough to share here though!). Then to my complete surprise a Kingfisher suddenly appeared in amongst a small flock of Redwing! This was very bizarre indeed but I wasn't going to look a gift horse in the mouth and a few images were rattled off. The Redwing didn't stay for long, they ate a few berries each and then off they flew again, but the Kingfisher stayed for at least 5 minutes! A very strange encounter indeed, all my previous encounters with Kingfishers have been close to rivers, lakes, ponds etc and not in the middle of a field! 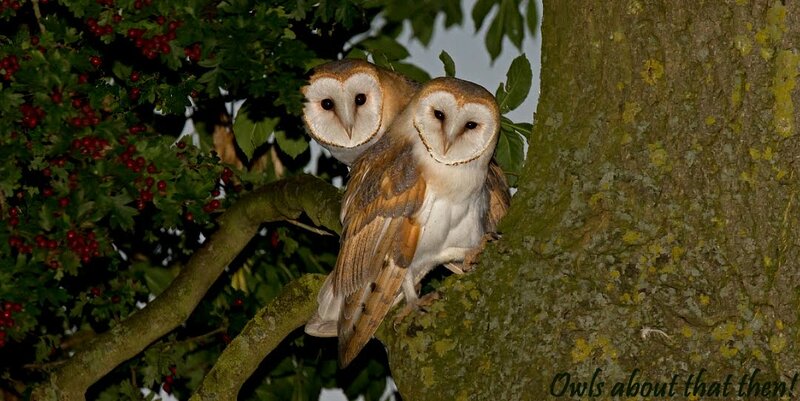 Well that's all for now folks, maybe an update on how my Barn Owls have fared this year in the next post? 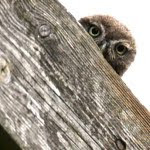 Hi all, as any regular readers/followers of this blog will know, I have over the years (with the help of my buddy Col Green) been designing, making and erecting owl nest boxes in south Leicestershire, over 130 so far. This is definitely a labour of love and when owls find one of the boxes and go on to use them as a breeding site it makes all the effort worth while. However, completing all this work and sourcing the required materials doesn't come cheap! In order to help maintain existing and to fund more new boxes I compile a unique owl calendar each year with all profits going back into the scheme. My calendar for this year has just been finalised and ordered with my supplier, each month features an owl image (four different species) that was taken by myself during 2016, see draft of each month below. The calendars are professionally manufactured using a high quality glossy 235g/m premium paper stock which gives the images a vibrant and vivid finish. The approx size when opened is 11" wide x 17" high and would complement any kitchen/study wall! This year I have again committed to a large quantity from the supplier, this has enabled me to keep the pricing as of previous years! 1 x calendar is £10.00 or two for £18.50, (plus p&p at £1.50). So would you like one of my 2017 owl calendars whilst also helping the owls? If so please either leave a message on my blog or email me at littleowl123@icloud.com and I'll get back to you asap with more details. Many thanks to anyone that is able to order a calendar, your support is greatly appreciated! Yes it has been a while since my last post, my apologies but for personal reasons I decided a while ago that I was going to take a break from the social media (Blogger) that I participate in. I will be back when the time is right and post a catch up of all the activities that I am still actively pursuing, especially my Barn Owl breeding programme which is thriving and 2016 has proven to be my best year so far! However, I am going to break my own self imposed rule on "no posts for a while" by offering this quick post following a most enjoyable few days break up in Ayrshire, Scotland with my mate Adey. We were on the Isle of Arran, (a beautiful place and would highly recommend a visit) our main objective was to search for Hen Harriers and then if luck was on our side maybe a few photo's of them too. After three days of solid searching two separate Hen Harrier sightings were made, one of a ringtail and the other of a very handsome male, some images were achieved but of rather poor quality due to the distances involved. For anyone who is a long term reader of my blog will probably recall the odd time I have mentioned that the Merlin has been my life long bogey bird. After many years of visiting potential sites (Scotland 4 times) my first ever sighting was made in Norfolk in January of this year, since then I have made a further 3 sightings at different locations, albeit all from distance and or very brief. Although no "record shot images" were obtained I was still very satisfied to have just made the sightings, until now! We were driving slowly along the west coast of the Isle near to Black Waterfoot when I spotted up ahead a small raptor like bird diving out of the sky at speed down near the seas edge. There was a scattering of small passerines (Rock Pipits) and the raptor species re-emerged catchless and disappeared further along the coast. We both witnessed this explosion of activity but couldn't be sure of the raptors identity although Merlin was suspected? I continued to drive slowly along the costal road hoping to see it again, then as we turned a corner there it sat on top of a small wooden building about 100 yards from us. 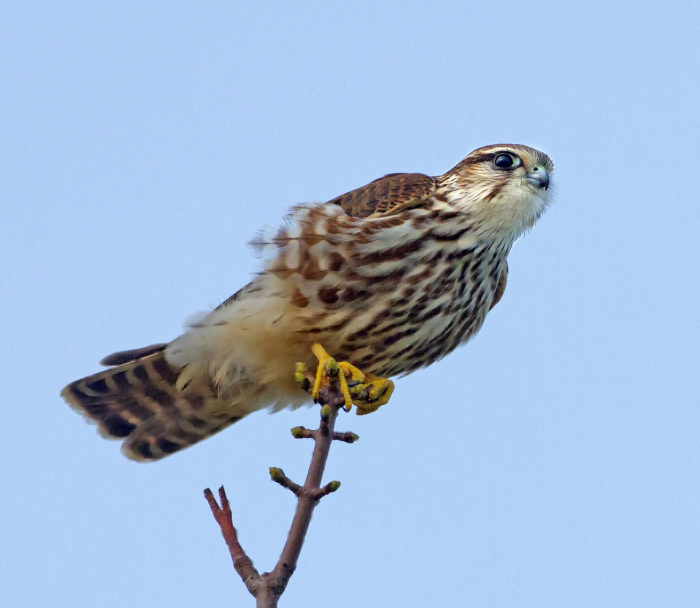 The car was stopped and the bird was viewed through our binoculars, 100% it was a Merlin. Windows opened and cameras at the ready the car was started and we inched nearer and nearer, 90 yards, 80 yards, 70 yards etc., we got to within 30 yards and the car was turned sideways so as to get an image out of the window then whoosh, off it flew, not even a distant record shot was obtained, sods law strikes again! For the next 20 minutes we drove slowly up and down trying to re-locate it, then Adey called out that there was a bird in a tree the other side of the bay to where we were, within seconds I got it in view in my binoculars, there it was again!! A painful and tentative drive around the bay commenced, we slowly got nearer and nearer until I dare not push my luck any further and the car was stopped. 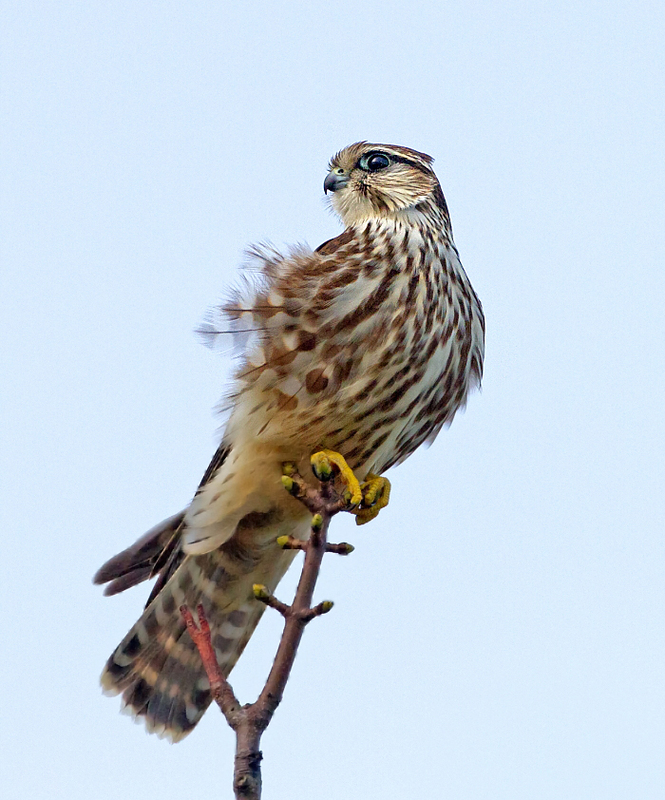 I poked my lens out of the window and BOOM, GET IN THERE my first ever image of a Merlin was in the can!!! I rattled off over 150 images of it (Adey 300+) before it flew off at speed along the coast, I haven't as yet had the time to go through/edit all my images but what a bird, (female/1st year juvenile) I suspect? I couldn't get over how lucky I was to have witnessed it hunting let alone to have captured and image of it, I do feel truly blessed. Its been a while since my last post, apologies on that count but any free time I've had recently has been spent checking out my owl nest boxes (initial signs are looking promising but more about that in a future post). Add to the lack of free time the fact I have been in France for the last week or so following England in the Euro's it's no surprise my blog has been dormant! Anyway, earlier this morning (Sunday) found me out at dawn, my initial target was to visit the Kingfisher family that I have been monitoring for the last 2 months. I knew there was a chance that whilst away I'd miss the juveniles fledging the nest? Upon arrival the male was seen on his usual perch guarding the nearby nest hole, occasionally another Kingfisher would dart by and the male would drop down off his perch and follow in hot pursuit. I was initially confused by this activity but then one of the "fly by" Kingfishers landed on a nearby post and I was able to confirm that it was in fact a juvenile bird! This was great news that they had raised a family, but slightly disappointing I wasn't here to witness all the action. With the lack of sightings of the female Kingfisher I can only come to the conclusion that she must be tucked away inside the nest chamber busily laying her second clutch? Before the rain became too heavy I was able to spend some quality time with the male bird and captured a few images of him in various poses, below. Hopefully back to my owls very soon, it's fingers crossed that all this heavy rain we are having at the moment doesn't have too much of a detrimental effect on their breeding success. The said tree and then the hole were soon located, it was a bit awkward getting the car into the right position as the track was very narrow, but after a bit of back and forth shunting I was ready. As is the norm with most woodpecker holes it was quite high, this meant pointing the camera up a quite an angle, this made it most uncomfortable as I sat there straining my neck. As I waited for a bird to show matters were made worse when it started to drizzle, this obviously lowered the light levels which in turn made getting a usable shutter speed even more demanding than just coping with the heavy shade from the tree canopy. I could cope with the additional challenge of the low light but then it started to rain heavier and due to the angle of the camera the lens started to get splattered with water droplets. I persevered and after the camera had been brought back into the car for its sixth or seventh wipe down a woodpecker showed. I was surprised it was a Great Spotted Woodpecker as all along I was expecting a Green Woodpecker? Anyhow, it was a nice male bird (red on the back of the head) it shuffled slowly upwards around the tree trunk, most of those images were too blurred to use as all I could muster at ISO 1000 was 1/50th of a second shutter speed. However, when it reached the hole it did hold its pose long enough for me to attain this first image. The Great Spotted didn't hang around long and was soon on its way, this gave me another opportunity to withdraw the camera once more for yet another quick dry off. The next half an hour or so was very quiet, then the rain ceased slightly which coincided with another woodpecker visit. But this is when I got totally confused as this time it was a Green Woodpecker that visited the cavity?? I rattled off a few shots and made the most of the slightly improved light levels (now at 1/200 second). This woodpecker, a female (lack of a red mustachial stripe) posed lovely at the hole entrance for me, I was reveling in this viewing, by far the best ever I'd had of this species. The brilliant views of her then came to an abrupt end as she flew off, initially I couldn't understand why she'd left but then I noticed the male Great Spotted Woodpecker had returned, he was this time a little closer and in much better light which lent for much better photography conditions. Then the fun and even more confusion (on my behalf) set in, the Green Woodpecker again returned which in turn shooed off the Great Spotted. This time she held her pose for a good while and I was allowed (by her) to spend a bit more time trying to get a better exposure. Then whilst I was watching and photographing her another movement caught my eye up near the hole, no it wasn't the Great Spotted that had returned yet again but the male Green Woodpecker (red mustachial stripe) that had stuck his head out of the hole! So after all that confusion it appears that the cavity did after all belong to the Green Woodpeckers and the Great Spotted was just being nosy, or maybe just a good neighbor? Thanks for stopping by, catch up again I hope?